All Library locations will be closed on Monday, October 9 for our annual staff training day. Regular Library hours will resume on Tuesday, October 10. In 1942, Ann Arbor High School graduate Walter Mast struck out on his own and opened Mast Shoe Store on S. Main St. No sooner had Mr. Mast opened the store than Uncle Sam called and Helen Mast took over running the store while Walter served in World War II. In 1949 Mast Shoes added a Campus store on Liberty with elegant departments for women and men. Their stores featured the latest styles in sandals, winter boots, trendy boots, and top brands for men. In 1968 the flagship store moved down to 217 S. Main and re-opened with much larger display areas. The Westgate store opened in 1993. In 1997, Tom and Greg Mast made the tough decision to close the Main Street store. In 2004, the Masts closed the Liberty St. store, concentrating their business to Westgate. Stop by Westgate and see the display of vintage photos they've put in the store to celebrate their 75th anniversary. All Library locations will be closed on Monday, September 4. Regular Library hours will resume on Tuesday, September 5. A total solar eclipse will be visible in North America on Monday, August 21. Although in Ann Arbor only a partial eclipse will be visible, it will still be an exciting event! In honor of this event, we have gathered some articles and pictures from past solar eclipses as seen in Ann Arbor. Ann Arbor News' photographer, Cecil Lockard, captured the 1970 eclipse in time lapse. 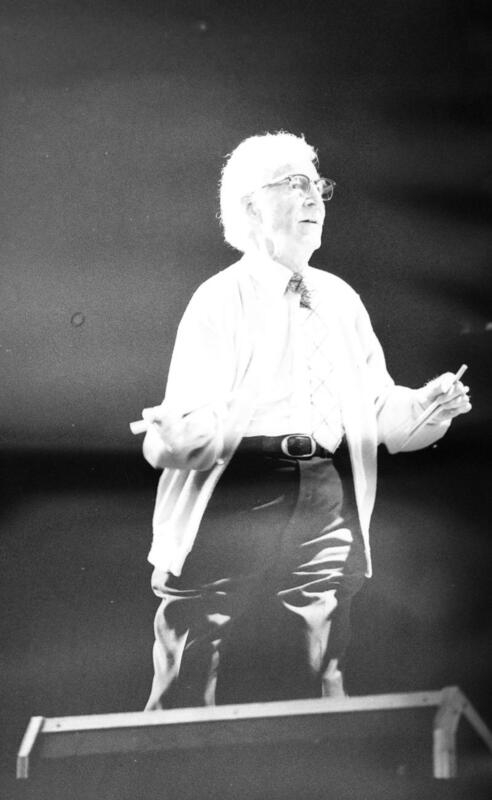 Examples of how to view the event include an Ann Arbor resident's pin hole box created for the 1963 solar eclipse, and the use of paper to project an image as seen in this picture from the 1994 eclipse. See additional photos and articles from the News pertaining to solar eclipses here. AADL and the Ann Arbor Area Transportation Authority (TheRide) are partnering this summer to provide Free Ride Saturdays during the AADL Summer Game! Every Saturday from June 17 - August 26, library cardholders can ride any of TheRide local fixed-route buses for free. All you need to do is show the driver your library card when boarding the bus! While riding, look for the AADL Summer Game code sign inside the bus and win 1,000 points to trade in for awesome Summer Game Shop prizes. Each bus has the same code inside the bus, so it's easy to find! When you see it, text the code to 4AADL (42235) or visit play.aadl.org to enter the code and get 1,000 points. •	Find the code featured on the outside of several buses for 500 points. •	Find the code hidden on TheRide.org on the MyAlerts Service page (which you can get to by clicking on "All Alerts" directly from the homepage) for 500 points. Find all the codes to earn the Ride Master Badge and a 500 point bonus! The AADL Summer Game is a great way to enjoy your summer and to ride TheRide for free! For more information on TheRide's routes and schedules, pick up a Ride Guide or visit TheRide.org. Nickels Arcade celebrates its Centennial this year and the Arcade and AADL are commemorating the milestone with exhibits, receptions and a digital history of the Arcade. AADL will host an exhibit at the Downtown Library beginning June 1, 2017, featuring photos, articles, and artifacts that tell the story of the first 100 years of Nickels Arcade. The Arcade "family" will have ongoing exhibits throughout the Arcade and a gala reception in July. When Tom Nickels inherited his father’s State Street meat market, he decided to tear it down and build the elegant European-style Nickels Arcade that is still there one hundred years later. He bought the land all the way down to Maynard from his siblings and then hired local architect Herman Pipp to design. The section on the southeast corner, then Farmers and Mechanics Bank and now Bivouac, was finished in 1915, but the rest was not ready for occupancy until 1917 due to shortage of materials during World War I. Soon the Arcade filled with up-scale businesses of the kind that European arcades aimed to attract. The oldest business is the barber shop, which opened in 1917 and, although changing owners periodically, has stayed in the same location offering the same service. The oldest store to stay in the same family is VanBoven Clothing, which opened in 1927 where the meat market had been located. The Caravan Shop opened the same year but has, like the barber shop, had different owners. Tom Nickels’ sister, Bee Nickels, opened a store that specialized in fine children’s clothing imported from Europe. Many of the other stores that opened in the first decade stayed for years, including a post office substation (until 1998), Bay's Jewelry (three generations until 1992), and Betsy Ross Restaurant (closed in 1975). Women’s undergarments were sold at the Van Buren shop, owned by Mae Van Buren, who had managed that department at Mack’s Department Store and knew how to do perfect fittings. From 1932 to 1982, a mainstay of the Arcade was the Arcade Newsstand at the State Street entrance. As the economy picked up after World War II, a crop of new stores opened that followed the pattern of pre-war tenants of staying for many years. Milford Boersma, who opened his travel business in 1945, was a pioneer in many phases of travel. Jessie Winchell Forsythe opened Forsythe Gallery, the first art gallery in Ann Arbor, in 1954. In 1956 University Flower Shop moved into space that had been Aunt Bees and has been a flower shop ever since. In 1987 the Arcade was placed on the National Register of Historic Places. Today, the Arcade is a mix of old-time stores, such as the tobacco shop that opened in 1964 and Arcadian Antiques, which dates back to 1983, with very “now” concerns such as Babo Juice and Food and Comet Coffee, keeping the European feel. All AADL Locations will open one hour late Tuesday morning. We apologize for the inconvenience, and we thank you for your patience! On March 25, 1965, civil rights activist Viola Liuzzo, 39, of Detroit was driving back to Mongomery, Ala., after a voting rights march in Selma with a black man, Leroy Moten, 19, one of the Selma demonstrators. A car carrying four Ku Klux Klan members began a high-speed chase down Alabama Highway 80. When they caught up with Liuzzo, the men opened fire, killing Liuzzo. Her passenger was uninjured. In 1983, five of Liuzzo’s children filed suit against the U.S. government and the Federal Bureau of Investigation for negligence, cover-up and violation of the their mother’s civil rights. The $2 million lawsuit was brought before a federal court because one of the four men arrested in the murder was an FBI informant. The non-jury trial was heard by U.S. District Judge Charles W. Joiner in Ann Arbor. The four Klansmen were arrested hours after the incident and charged with conspiring to violate the civil rights of the victim, but one of them, Gary Thomas Rowe Jr. was later dropped from a state grand jury’s murder indictment because he was an undercover FBI informant. An 1975 investigation by the Senate Select Committee to Study Government relations began an investigation. Rowe testified that he has participated in acts of violence that were known and approved by the FBI. Rowe was indicted in the Liuzzo murder in 1978 by an Alabama grand jury but had not been tried because of legal complications. The trial in Ann Arbor opened on March 21. The five Liuzzo chidren –Anthony, Thomas, Penny, Mary and Sally – allege that Rowe killed their mother or failed to prevent the slaying as an agent of a law enforcement agency. The other three men in the pursuit car were tried for murder in Alabama but acquitted. Read a good book lately? Suggest it for Washtenaw Reads 2018! The Washtenaw Reads screening team is meeting throughout the summer to select finalist titles for the Read and they want your ideas! The Washtenaw Reads program is a community initiative to promote reading and civic dialogue through the shared experience of reading and discussing a common book. Participating libraries and communities include Ann Arbor, Chelsea, Dexter, Milan, Northfield Township, Saline, and Ypsilanti. To suggest a title visit Washtenaw Reads or the Washtenaw Reads Facebook page. Washtenaw Reads 2018 will take place January - February 2018. Due to a fiber problem, Pittsfield Branch is currently without Internet connection. This affects public computers, wifi, and catalog searching at Pittsfield Branch. Staff can still assist with checkouts that will be processed later once connectivity is restored. Thanks for your patience, and stay tuned! The 55th Ann Arbor Film Festival Begins Tonight! AADL will once again be an official community partner for this year's Ann Arbor Film Fest, and will cosponsor Films in Competition 8: Almost All Ages on Saturday, March 25 at 11 am at the Michigan Theater. This special screening features 12 short, family-friendly films. Make sure to enter the code AAFF55_AADL for a discount on your advance ticket! You can see the festival's entire schedule and buy tickets on the Ann Arbor Film Fest’s website. The Ann Arbor Film Festival is the longest-running independent and experimental film festival in North America. The 55th AAFF takes place March 21-26, 2017 and presents over 200 films from across the world with dozens of world premieres. For more information, please visit the Ann Arbor Film Festival’s website. In 1951, President Harry S. Truman created the Federal Civil Defense Administration (FCDA). This was the Homeland Security Department of its day and it churned out films, brochures, and other propaganda materials purporting to protect Americans from nuclear bombs (as well as other fallout from the Cold War) in the name of national security. From the 1950s through the 1970s, Americans turned away from the more practical civilian endeavors of the WWII era such as scrap collecting and bond drives to build fallout shelters and stockpile supplies or engage in atomic air raid and other civil defense drills. They even staged mock disasters. In retrospect, some of this emergency preparedness seems a bit silly, but at least it gave Americans something to do in a time of international uncertainty - and Ann Arbor was no exception. Here is the Ann Arbor News’ “Civil Defense” photo negative collection for your viewing pleasure. Next year will mark the 50th anniversary of the founding of the Our Own Thing organization here in Ann Arbor. With Black History Month upon us, now is a great time to acknowledge the work of this incredible group started in 1968 by Dr. Willis C. Patterson, Singer A. "Bucky" Buchanan, Jon Lockard, and Vera Embree. Countless African-American students in the area have benefited from the cultural arts instruction provided by Our Own Thing, as well as their scholarship program which has sent numerous young artists and musicians to Interlochen Arts Academy. Watch the interview of Dr. Patterson from the AACHM (African American Cultural & Historical Museum) Living Oral History Project for a deeper look into the organization and the amazing man behind the scene. 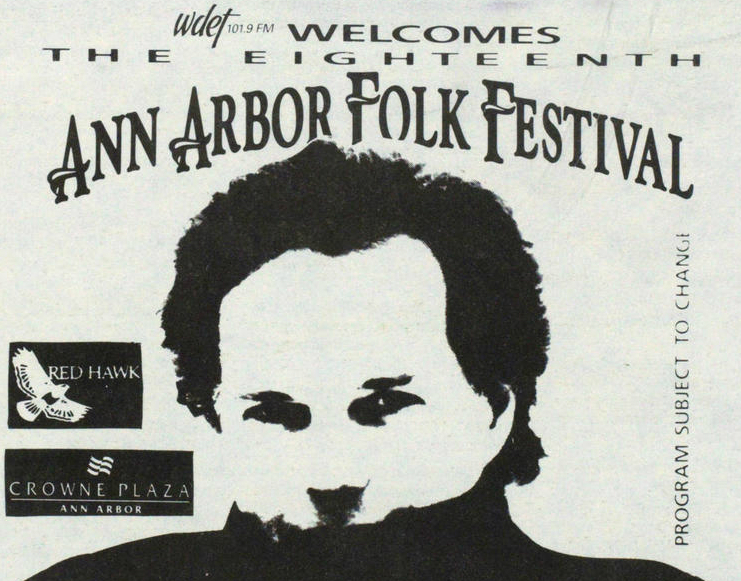 Leo Kottke's forehead graced the poster for the 18th edition of the Ann Arbor Folk Festival. History is a mystery, even when you have direct access to media coverage of an event. 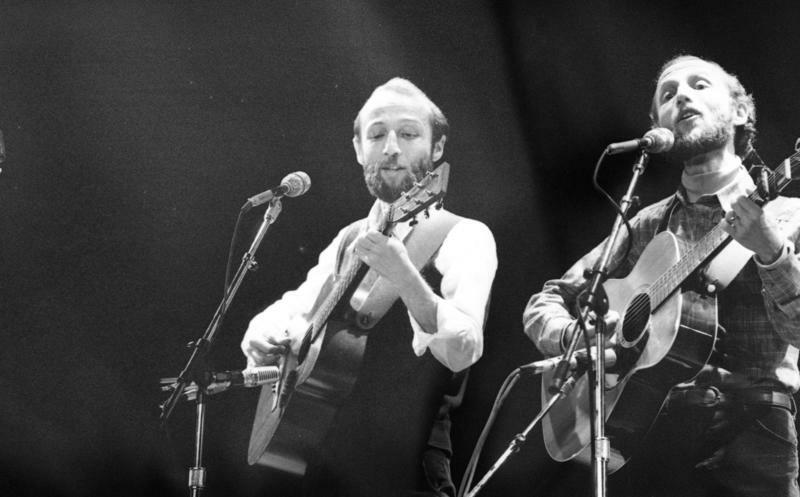 The first Ann Arbor Folk Festival was held June 13, 1976, headlined by John Prine and Leon Redbone. The show was hosted by the Power Center and, as always, it was to benefit The Ark, which was just 11 years old at that point and still in its original location, a house at 1421 Hill St.
Doug Fulton’s June 14, 1976, Ann Arbor News review of that first fest really only covers the early part of the evening -- newspaper print deadlines, you know -- and Prine and Redbone are mentioned with no commentary. 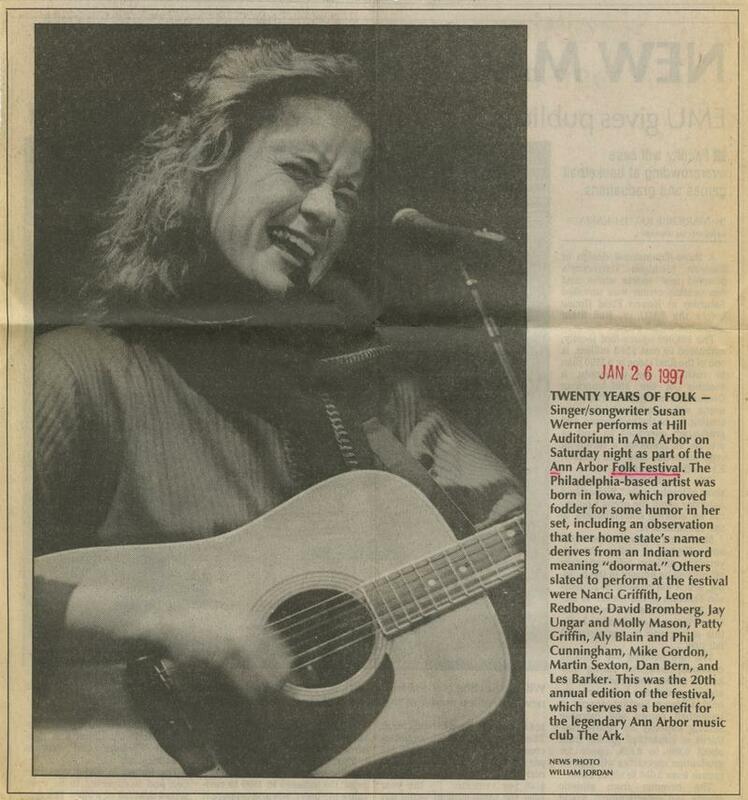 In fact, The Ark could have just changed its name to Financial Trouble since the venue was constantly in jeopardy through the mid-'80s until this 1986 article declared otherwise: "The Ark No Longer Needs The Festival To Stay Afloat". 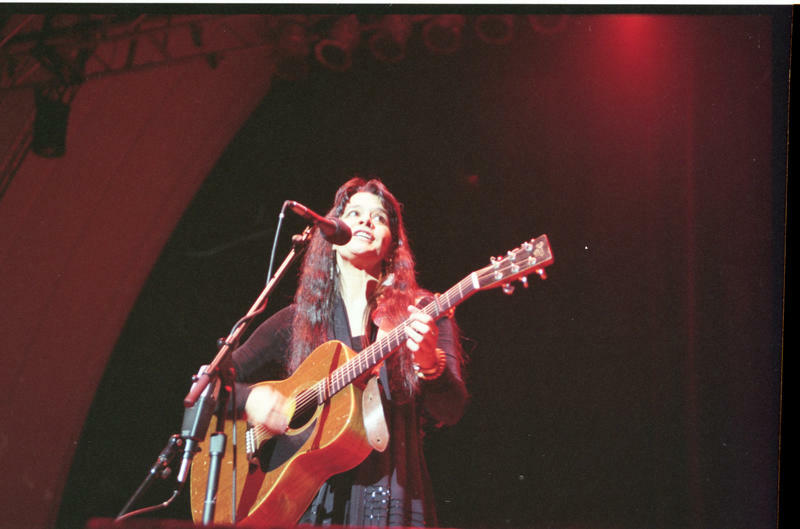 Since that first festival, and two moves later, The Ark is one of the most respected and well-oiled folk- and roots-music concert venues in the country, though the nonprofit still counts on the Ann Arbor Folk Festival for part of its operating revenue. This year’s edition, held January 27 and 28 at Hill Auditorium, has one of the festival’s biggest lineups yet, featuring headliners Kacey Musgraves and Jenny Lewis on Friday and the Indigo Girls, Margo Price, and Kiefer Sutherland (yes, him) on Saturday. (If you're somehow still undecided about going, The Ark has also compiled playlists for night one and night two of the fest. But if the festival started in 1976, why is this weekend’s celebration its 40th, instead of the 42nd? According to The Ark’s website, which lists lineups from every year of the festival, the event didn’t happen in 1977 or 1978. It came back in 1979 and has continued ever since. 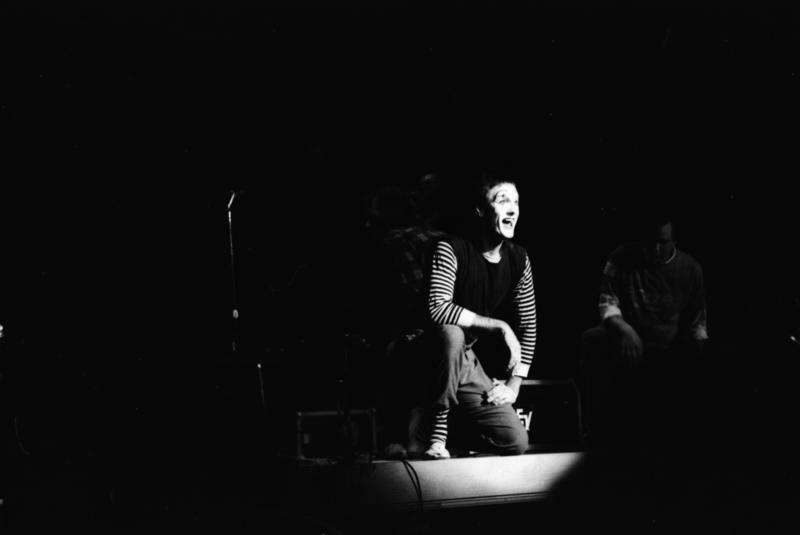 In 1982 the fest moved from the Power Center to the Michigan Theater and then in 1985 found its annual home at Hill Auditorium (save for one return to the Michigan in 2003). 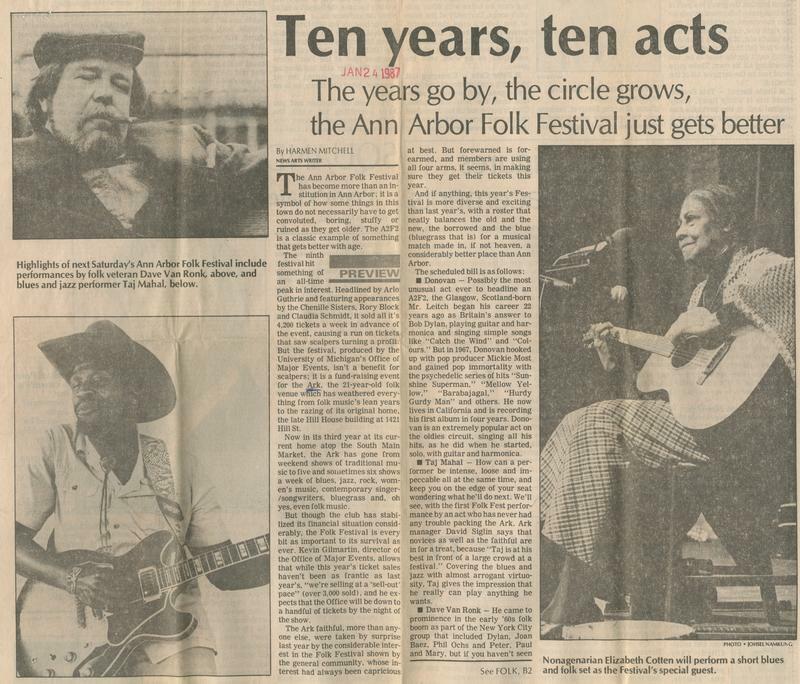 The Ann Arbor News covered the festival every year -- we imagine. The library acquired the News’ archives in January 2010 and has been working on organizing and digitizing it, with updates at oldnews.aadl.org. 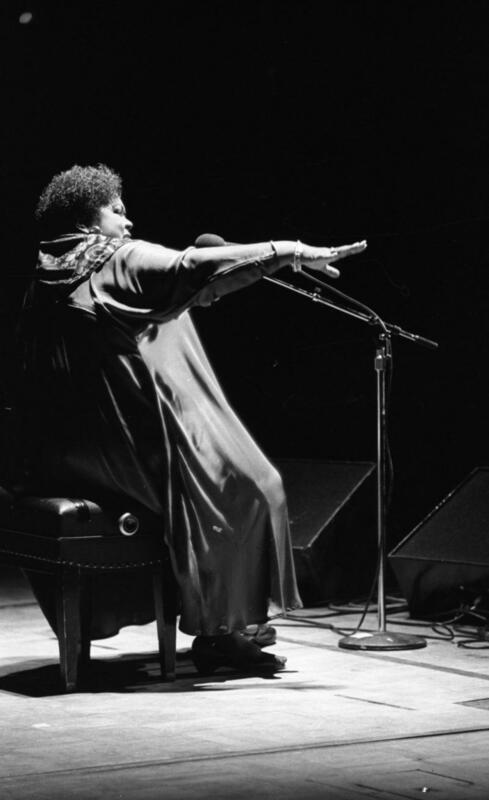 Since there are many moving and missing parts to the News’ archive, we couldn’t find Folk Fest articles and photos from every year. But we did find a hodge-podge of images that might jog your memories, plus a few YouTube clips from recent years. If you want to check out the what we've archived so far from the News' Folk Fest coverage at Old News, click here. 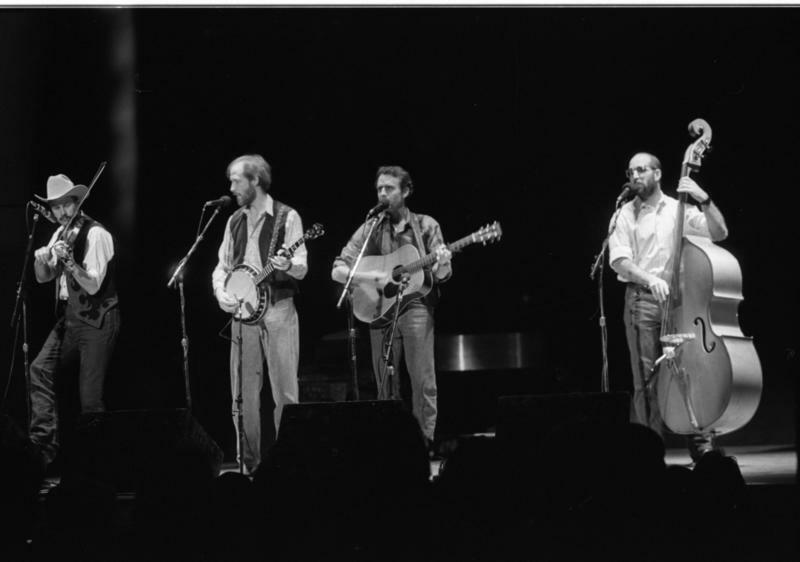 Plus, you can check The Ark's own history of the Folk Fest here. 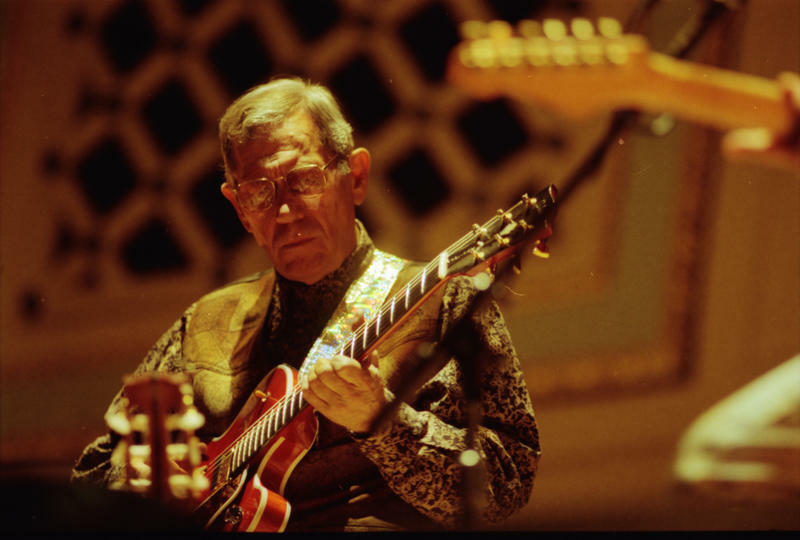 Jay Ungar and David Bromberg were there from the start. OK, this news report is not about the Folk Fest, but it does show the state of The Ark at the time. Twins Sandor and Laszlo Slomovits perform as Gemini. Percy "Mr. Bones" Danforth gets loose with his rhythm sticks. The MC for this year was mime O.J. Anderson. We'll leave you to your nightmares now. 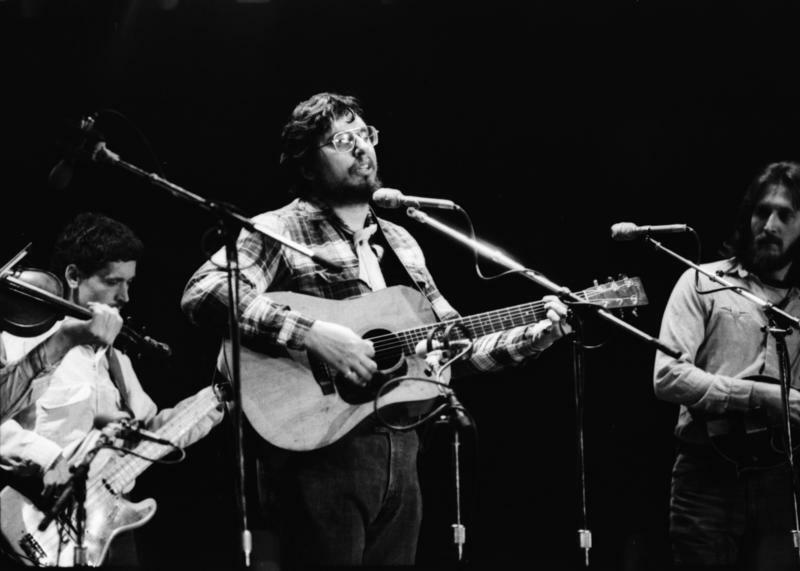 David Bromberg has performed at the Folk Fest 10 times. 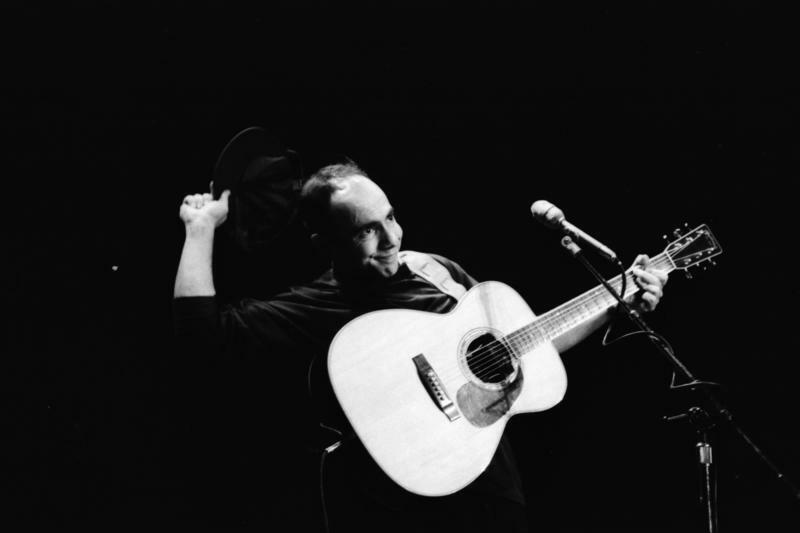 Pretty sure Steve Goodman just saw a mime. 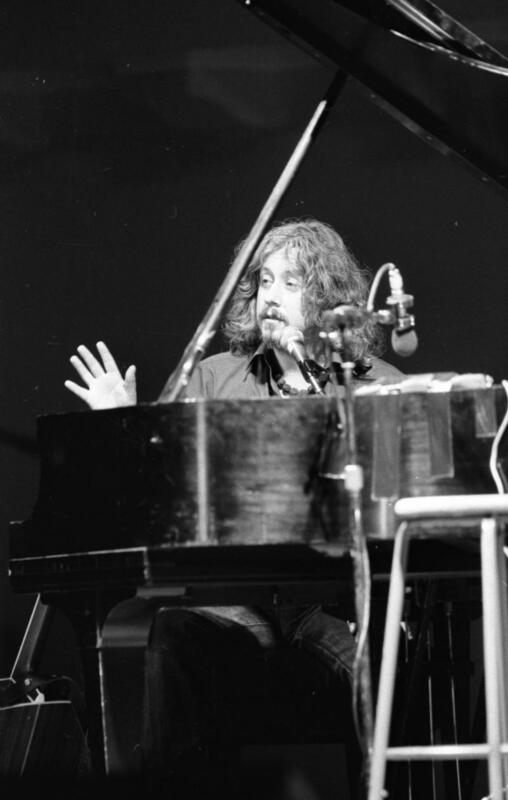 Arlo Guthrie made a surprise appearance at the 1985 Folk Fest, but he returned as the scheduled headliner this year. A clipping from The Ann Arbor News. Michigan bluegrass legends The RFD Boys twanged the night away. Storyteller Jackie Torrence lets loose one of her captivating tales. 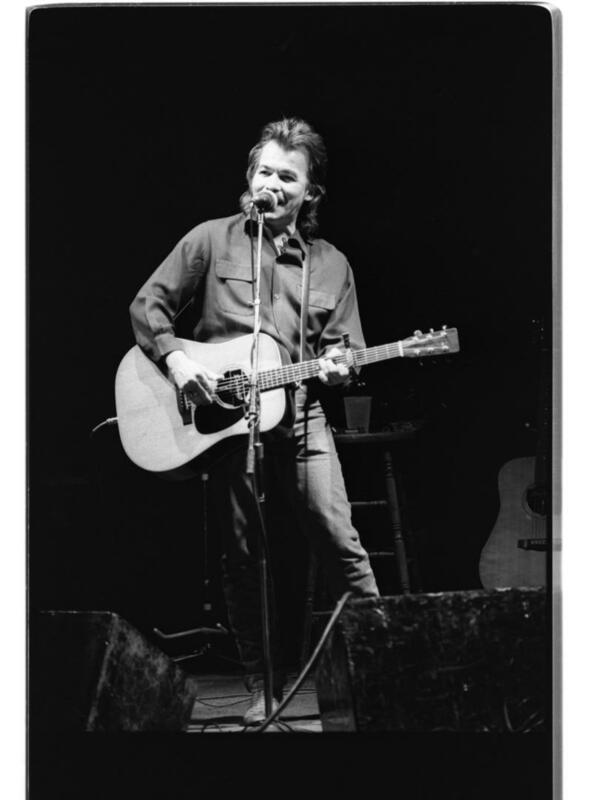 John Prine helped launch the Folk Fest in 1976 and returned to headline 13 years later. 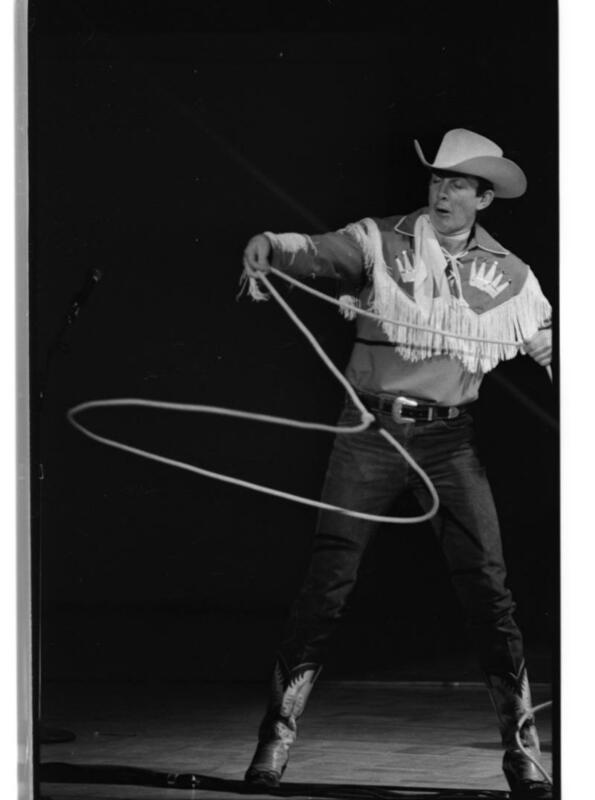 It's entirely possible that this Riders in the Sky member created beautiful music with his lasso. 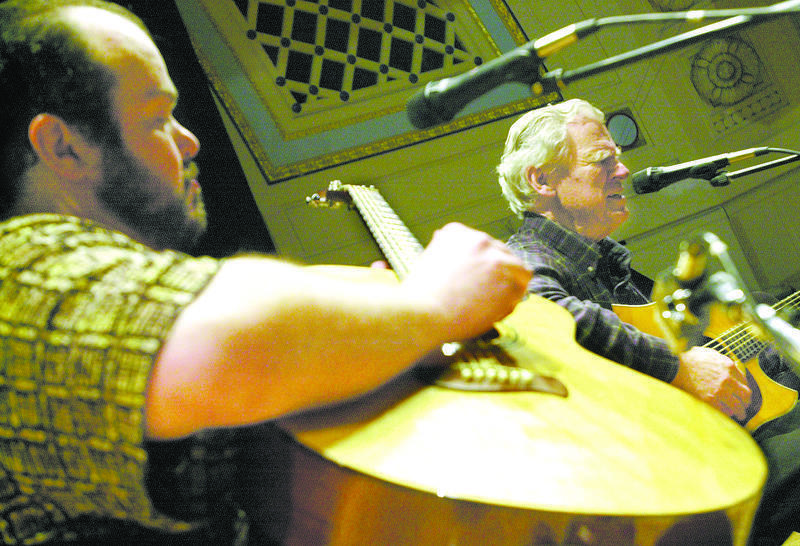 Even at 71-years-old, guitar pioneer Chet Akins brought the house down with his fierce fingerstyle playing. 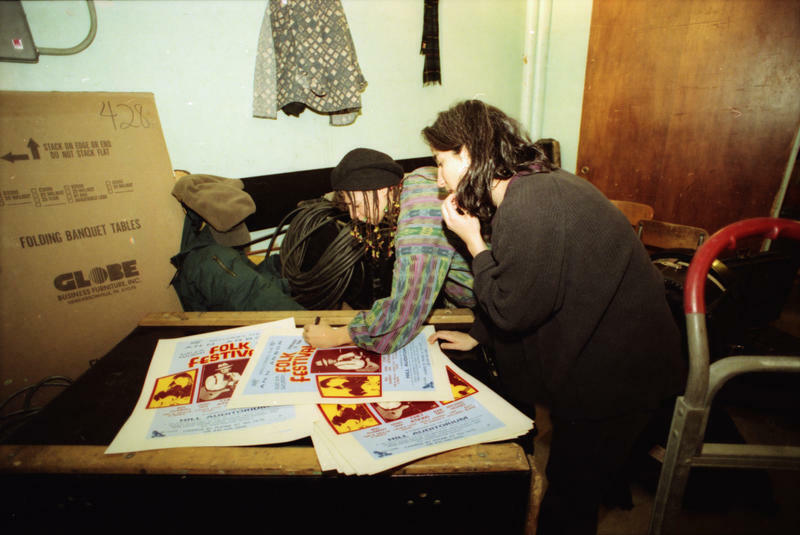 Laura Love signing posters backstage. Michael Hedges in rehearsal before the show. Carrie Newcomer smiles at the folk(s). 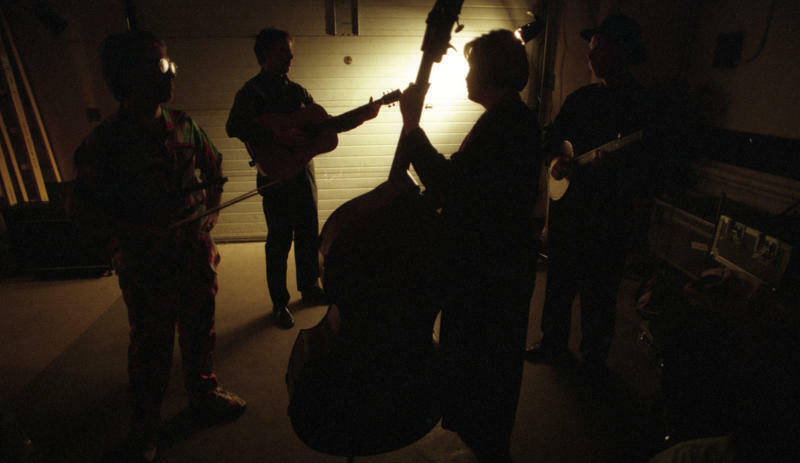 A moody moment backstage with The Raisin Pickers. An animated Anne Hills entertains Hill Auditorium. 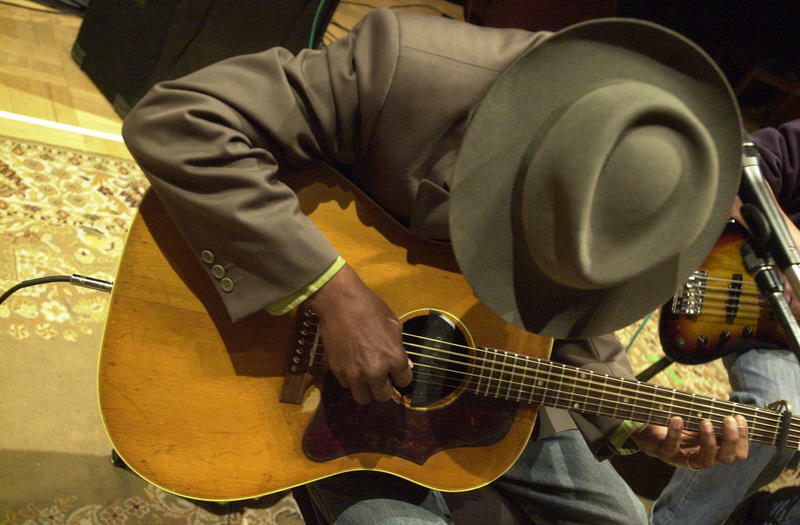 We swear that's Eric Bibb under the hat. 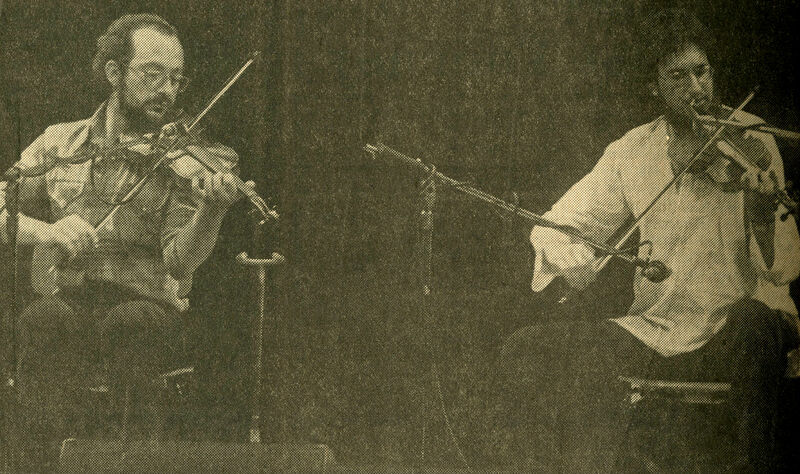 David Grisman and Doc Watson rehearse before the gig -- as if these masters needed to do that. 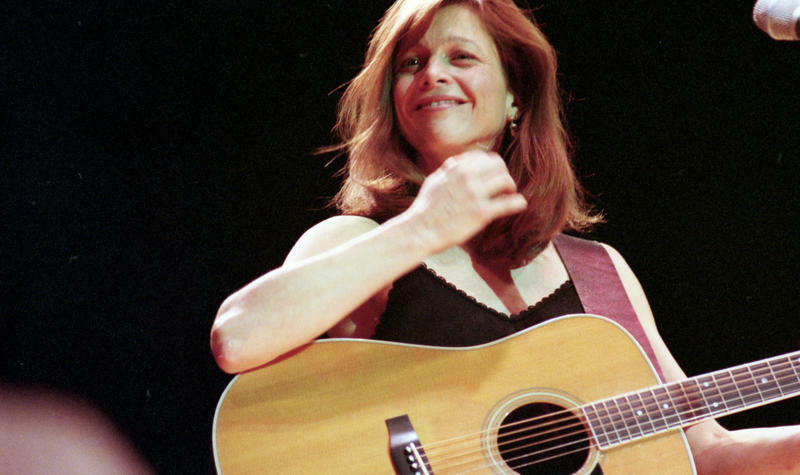 The 40th Ann Arbor Folk Festival happens Friday, January 27, and Saturday, January 28, at Hill Auditorium. For the full lineups, times, tickets, and more information visit theark.org. Due to Inclement weather, all AADL Locations will delay opening until Noon today. Thanks for your patience and stay safe! John Glenn, American hero, U. S. senator, WWII and Korean War veteran, and icon of the Space Age, on the day he became the first American to orbit the earth. Today we remember and honor the U. S. citizens who were killed in the Japanese surprise attack on Pearl Harbor in Hawaii on December 7, 1941. Here in Ann Arbor, a strange piece of Pearl Harbor history was paraded through our streets in the summer of 1943. Give a listen to the Ann Arbor Stories Podcast, The Suicide Sub Comes to Ann Arbor for the quirky details, and take a look at the newspaper's coverage of the Japanese Suicide Submarine Tour. The Ann Arbor District Library has again been awarded the highest ranking a library can achieve in Library Journal’s annual ratings systems of libraries nationwide, and was named a 5 Star library in LJ’s just-released Annual Index of Public Library Service. AADL has been ranked a 5 Star library since the rating system began in 2008 and currently ranks fourth of ten 5 Star libraries within its operating expenditure category. Four other Michigan libraries received star rankings this year. Richland Community Library was named a 5 Star library within its category, West Bloomfield Township Public Library received 4 stars, and Kalkaska County Library and Pentwater Township Library received 3 stars. Congratulations to our fellow Michigan libraries! 80 years ago, on November 3, the News posted this "Electoral Thermometer" on the outside of its new building at 340 E. Huron St. Total electoral votes were then 531, with 266 needed to win. At this point in the day, candidates Franklin D. Roosevelt (Democrat) and Alf Landon (Republican) are neck and neck. The car parked at lower right with ladders sticking out the back is from the Ann Arbor Window Cleaning Co, which is presumably how they adjusted the "thermometer" as returns came in. 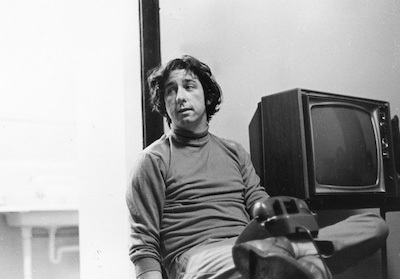 Activist, lawmaker, author, and politician Tom Hayden died yesterday at 76. Hayden took the hard route towards politics with his involvement with the University of Michigan's Students for a Democratic Society (SDS) and helped write one of the most significant 20th century political manifestos: the Port Huron Statement. His participation in the disruption of the 1968 Democratic convention as one of the fabled "Chicago Seven" made him an international celebrity. Visits to Hanoi during the Vietnam War brought attention to the conflict in ways that were unpredictable at that time, and his marriage to Jane Fonda gave him a celebrity-status he never quite lived down. Right or wrong, Hayden proved that one voice can make a difference in American politics. Conventionally unsuccessful, he nonetheless served as a model for democratic political participation in ways that more orthodox politicians would never have dared to attempt. Watch AADL's 2014 video "A Call to Battle Against the Climate Crisis", Hayden's discussion on how Michigan and the Great Lakes region can move the U.S. towards the protections of a clean energy economy. 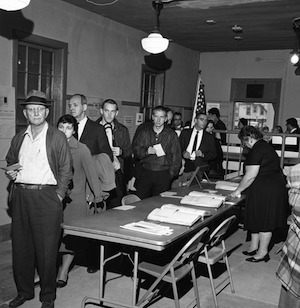 On November 3, 1964, the voters of Ann Arbor came to the polls to vote for President of the United States . . . and they came and they came. When the City Clerk finished counting, a new voter turnout record was set at 29,409. The Ann Arbor News tallies for Washtenaw County showed a 16,000 vote advantage for President Johnson over Barry Goldwater, a trend that was mirrored nationwide. Ann Arbor and the County also set a record for ticket-splitting, handing Governor Romney a sizable victory over Ann Arbor's Neil Staebler. In the lead-up to the election, the News published a voter education guide, What You Should Know To Make Your Vote Count In 1964. The Guide featured profiles of the federal candidates and statewide candidates for Governor, Lt. Governor, Secretary of State and Attorney General. You'll see some very familiar names on the page. Included were civics lesson on Courts in Michigan, local elections and general elections. The 1964 election stood out for another reason: for the first time voters would elect the Governor and Lt. Governor as a team from the same political party. There was only one statewide ballot proposal and the question will be very familiar to voters in 2016. Fast forwarding to 2016, the Michigan League of Women Voters has produced a non-partisan Voter Guide that is available at all AADL branches. The Ann Arbor League of Women Voters has been conducting local candidate forums that are available from the CTN Video On Demand page as well being rerun throughout the election cycle on Channel 19. The Ann Arbor City Clerk has a web site with all the info you'll need to vote. The last day to register to vote is Tuesday, October 11, 2016. If you're not sure if you're registered or your voter information is up-to-date, check it out on the SOS Michigan Vote site. If you'd like to vote absentee, you can print off the Application for Absentee Ballot directly or stop by one of AADL's branches and we'll be happy to print it out for you. On February 12, 1960, Lela Duff launched a column in the Ann Arbor News called Ann Arbor Yesterdays that became so popular with readers that it ran for 75 weeks covering every aspect of local history in Ann Arbor and Washtenaw County. Ms. Duff was well known to thousands of Ann Arbor High School students but after 34 years of teaching English she retired and began her "second career" as a local historian. Ann Arbor Yesterdays began, fittingly, with a discussion of the history of the naming of Ann Arbor. Her research was impeccable, using every available University, City, County and private archive and collection to tell the story of our development. Although historic buildings where a continual topic of the columns, Ms. Duff gave readers a rich tableau that included the immigrants who settled the area, theaterand civic organizations, music and recreation. The story of Lower Town and Downtown, the University and the names that made them possible. Ms. Duff devoted five columns to the early churches of Ann Arbor, from First Presbyterian to St. Thomas. There were humorous columns on crime and youthful shenanigans. Two of the most heartfelt columns were a remembrance of Armistice Day, 1918 and Albert Warnhoff who made sure Christmas came to all children. 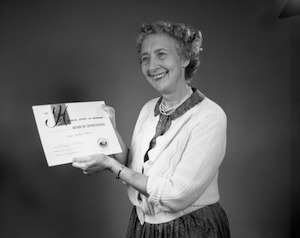 Ms. Duff bid Ann Arbor News readers goodbye in July, 1961 and was immediately honored for her columns by the Historical Society of Michigan. And by October the columns became one of the most popular and enduring local history books in Ann Arbor. You'll want to check out a copy of Ann Arbor Yesterdaysfrom AADL to see the added illustrations and photos that bring to life the buildings and people from her columns. Ms. Duff continued to fight the good fight for historic preservation throughout her life. The "Grand Lady" of local history died in 1983 but her legacy lives on in her columns, her books and her commitment to our past. 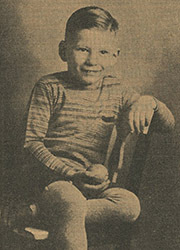 On March 8, 1935, the frozen body of seven-year-old Richard Streicher Jr. was found under a bridge in Island Park in Ypsilanti by another youngster, Buck Holt. The brutal murder remains unsolved to this day. Local law enforcement quickly developed a profile of the killer and the lurid headlines of follow-up articles left nothing to conjecture on the part of readers. The Mayor of Ypsilanti went so far as to warn parents to keep their children indoors with a "maniac" on the loose. Richard's parents and relatives were brought in for questioning and the Michigan State Police were called in by Governor Fitzgerald to assist in the investigation. Lead after lead went dry, suspects were interrogated and released, and new clues failed to develop. In August, Circuit Court Judge George W. Sample took the unusual step of convening a one-man grand jury to air all the evidence thus far to put an end to the "intense feeling and suspicion within the community" regarding the investigation. The grand jury stretched to three weeks as local law enforcement officials were grilled and reluctant witnesses held in contempt but in November, 1937, proceedings were indefinitely suspended. Leads in 1938 and 1939 proved fruitless as well. Although Ann Arbor News coverage of the Streicher case all but ended in 1939, interest in the case continued in the county. A 2007 article in Ypsilanti Gleanings asked readers for any information they might have on the case. Recently, an obituary appeared on MLive announcing a formal graveside service and that funds had been raised to provide for a beautiful headstone for young Richard Streicher Jr.
We recently stumbled upon an envelope of Ann Arbor News photo negatives from September 1940 titled “Radical Demonstration on Behalf of Dismissed Student Reinhardt," which eventually led to information on the student in question (including the correct spelling of the name): Hugo Reichard. It turns out that Reichard, along with several writers for the student-run Michigan Daily and members of the campus left-leaning American Student Union (ASU) had been ousted by U-M President Alexander G. Ruthven for “radical” and “fifth-column" activities following an April peace rally on campus - a decision that caused considerable controversy among faculty and students that year. 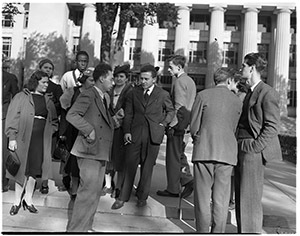 In November, two months after the photographs were taken, an “open hearing” on behalf of the dismissed students, sponsored by the Michigan Civil Rights Federation and the Michigan Committee for Academic Freedom, took place off campus in Ann Arbor’s Island Park. Roughly 500 people - including students, faculty, and family members - attended, where lawyers and members of the UAW-CIO excoriated Ruthven’s decision as a violation of the students' civil rights. The Ann Arbor News briefly covered the event in two articles, “Protest meeting is held at park” and “Father upsets ouster trial,” and further weighed in with an editorial on the hearing organizers' brazen use of "Marxist techniques." Meanwhile, Ruthven defended his position in a speech in Chicago, where he advised administrative officers and professors of colleges and universities to "rid themselves of the notion that romanticism, sentimentalism, and indiscriminate tolerance are essential constituents of democracy." And on Friday, November 16, several former Michigan Daily writers, now leading newspapermen around the country, voiced their opinions on the matter during the Daily’s 50th anniversary dinner held at the Michigan Union. With World War II raging in Europe and the United States not yet committed, these were indeed interesting times. For more on this controversial moment in U-M's history, read the 2015 article "The Doves of 1940" in Michigan Today by James Tobin. Crusading district attorney, governor of New York and two-time Republican nominee for president Thomas E. Dewey was a 1923 graduate of the University of Michigan with a soft spot in his heart for his alma mater. 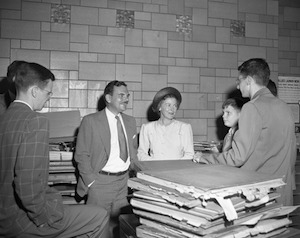 In July 1947, Dewey came with his wife Frances Hutt Dewey, and their two sons, Tom Jr. and John, to visit the campus and town. It was the year before his second run the presidency in 1948. Dewey suggested that the trip was to show his school to his 14-year-old Tom Jr., "a prospective student." He and his family met with UM President Alexander Ruthven, received a tour of the campus, including the Student Union, the office of the Michigan Daily and marveled at the growth of the school and town since he was an undergraduate. At Michigan, Dewey was active on campus. He was editor of the Michigan Daily and performed in the campus choir. A photo from 1921 shows Dewey dressed as leprechaun for campus production of "Top of the Mornin'". 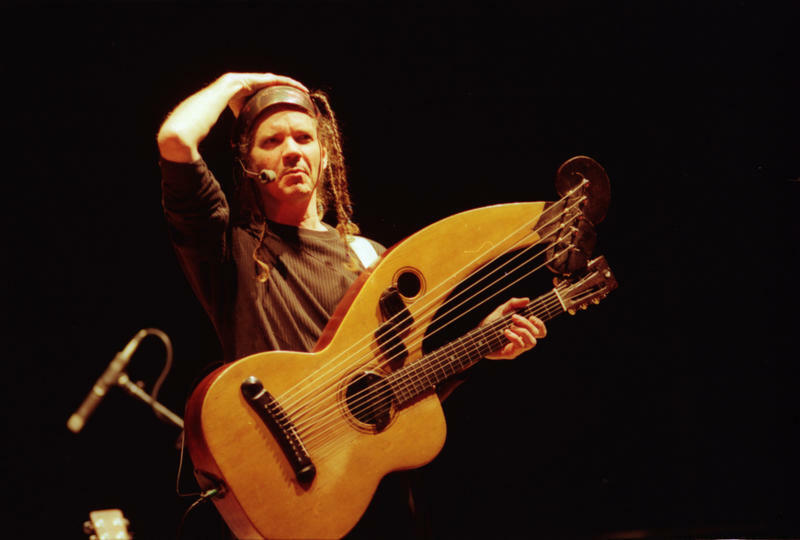 He gave up a career in music for the law, attending Columbia University Law School. In 1956, Dewey returned again to UM campus to attend a meeting of Ann Arbor Republicans, meet with campus Young Republicans and promote the campaign of incumbent GOP President Dwight Eisenhower. Dewey was the first UM graduate to run for president of the United States. He was nominated in 1944 to run against incumbent President Franklin D. Roosevelt and in 1948 to run against incumbent Harry Truman. In 1958 the UM Board of Regents gave Dewey an award for Outstanding Achievement. 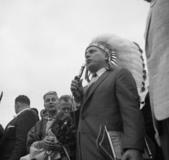 Dewey was a native of Owosso, Mich.
Old News has unearthed some photos from Jimmy Hoffa's triumphant return to Michigan following his election as President of the International Brotherhood of Teamsters in October, 1957. Over a thousand Michigan Teamsters lined up to welcome 'Jimmy' back home. Willow Run Airport was awash in cars and semis. An honor guard preceded Hoffa onto the stage where he delighted the crowd with his homecoming speech. The Teamsters presented Jimmy with a Native American headdress to symbolize his new leadership role. Hoffa had delivered a fiery speech at the convention decrying the McClellan Committee investigation and anti-labor legislation pending in Congress. Mr. Hoffa disappeared on July 30, 1975 three years after his tenure as President of the Teamsters ended. On Friday, August 26, 2016, world champion triathlete Karen McKeachie was killed in a collision with a car on Dexter-Chelsea Rd. Ms. McKeachie won hundreds of events in cross country, road races and triathlons and was inducted into the USA Triathlon Hall of Fame in 2014. She tried to join the cross country team at Dexter High School but was told only boys could compete for the school. Undeterred, she turned to even longer races and in 1977 set her sights on the Boston Marathon. By the 1980s she was focusing on triathlons like the Ironman, traveling the world in competition. Over the years she won numerous Dexter-Ann Arbor runs and Great Lakes Triathlons at Half Moon Lake. McKeachie never stopped training, competing in elite and Master Division events. In 2000 she was honored as the USATriathlon Amateur Triathlete of the Year. Karen McKeachie was also a mentor and inspiration to many local athletes and will be missed sorely by all her knew her. All Library locations will be closed on Monday, September 5. Regular Library hours will resume on Tuesday, September 6. 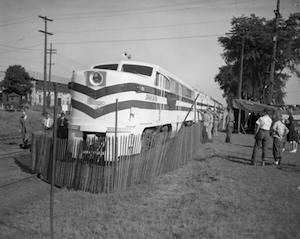 On August 18, 1948, the Freedom Train pulled into Ann Arbor at Ferry Field. This traveling museum of the most important documents in American history gave people a rare opportunity to view and learn about America's founding documents, historic events and guiding principles. Washtenaw County decided to celebrate the exhibit in a very big way with a week of parades and events leading up to the train's arrival. There was a Veteran's Parade, a Children's Parade, a Community Organization's Parade, a Voter Registration Day, parties and speeches throughout the County. The Ann Arbor News covered the events extensively and put out a special Freedom Train edition. Old News has published the photos the Ann Arbor News photographers took -- not just the few that made it into the paper. There were floats galore, bands aplenty, excited kids, a sea of bikes, long lines at Ferry Field and in the Exhibit. An interesting part of the special edition were the ads by local merchants tailored to the exhibit. Each ad highlighted an important freedom like trial by jury and unlawful search and seizure, or a civic duty like voting and volunteering. The focus of many of the ads and speeches were those running for office, exhorting them to be fully educated to our Constitution, Bill of Rights and civil liberties. 1948 was a Presidential Election year and the Freedom Train's travels throughout the 48 states surely had an impact on candidates and voters.